Product prices and availability are accurate as of 2019-03-10 16:20:32 UTC and are subject to change. Any price and availability information displayed on http://www.amazon.com/ at the time of purchase will apply to the purchase of this product. Nothing beats the scent of fresh zucchini, banana and other quick breads baking in the kitchen. This Paula Deen signature nonstick Bake ware 9-inch x 5-inch loaf pan is the ideal baking partner to help make delectable sweet and savory loaves with ease. Constructed to stand up to the demands of daily baking, the solid carbon steel pan features rolled rims that resist warping. 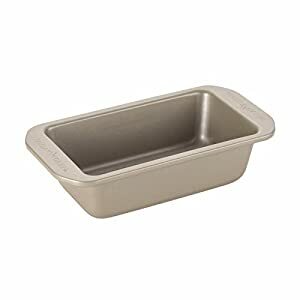 It is also coated inside and out with a gorgeous champagne-colored nonstick that aids in even browning of baked goods, helps with easy food release, and makes cleanup a breeze. The bread pan is perfect for mixing up mama's pound cake from Paula, and grab several to make holiday breads for gifts. The loaf pan's wide handles offer a confident grasp, and they're oven safe to 450 Degree F. This efficient pan works well with the cake and muffin pans and other bakeware pieces in the Paula Deen signature collection. fill The kitchen with baking joy and the aroma of freshly-baked quick breads galore, using the convenient Paula Deen signature Bake ware nonstick 9-inch x 5-inch loaf pan.